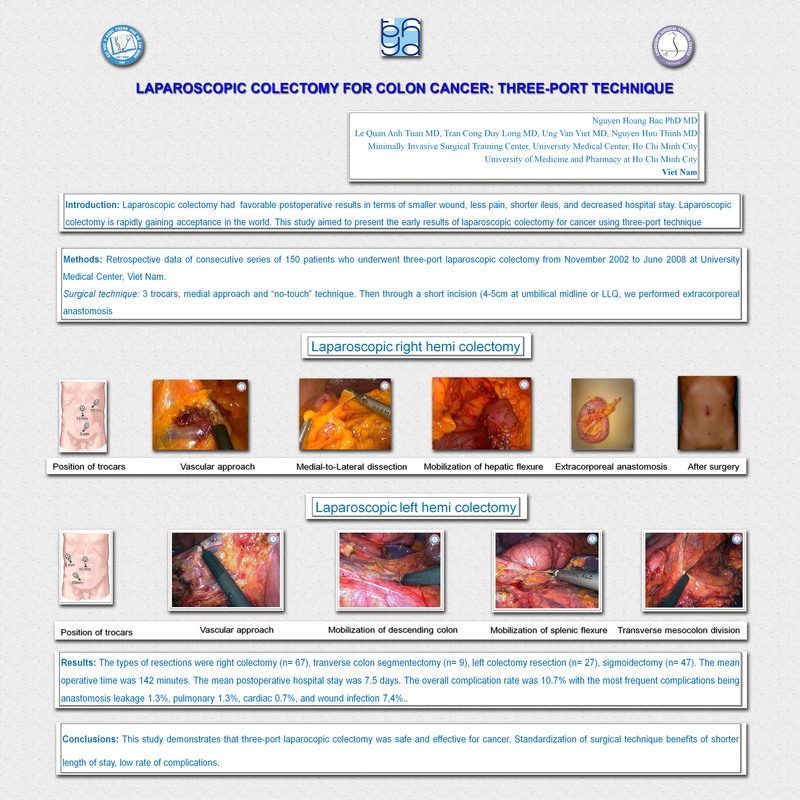 Introduction: This study aimed to present the early results of laparoscopic colectomy for cancer using three-port technique. Methods: Retrospective data of 150 patients who underwent three-port laparoscopic colectomy from November 2002 to June 2008 at University Medical Center Viet Nam. Results: The types of resections were right colectomy (n= 67), tranverse colon segmentectomy (n= 9), left colectomy resection (n= 27), sigmoidectomy (n= 47). The mean operative time was 142 minutes. The mean postoperative hospital stay was 7.5 days. The overall complication rate was 10.7% with the most frequent complications being anastomosis leakage 1.3%, pulmonary 1.3%, cardiac 0.7%, and wound infection 7,4%. Conclusions: This study demonstrates that three-port laparocopic colectomy was safe and effective for cancer. Standardization of surgical technique benefits of shorter length of stay, low rate of complications.